MOSCOW, February 16. /TASS/. Russia’s MiG Aircraft Corporation has completed factory trials of its next-generation MiG-35 multirole fighter jet, the corporation’s press office told TASS on Friday. "The factory trials of the MiG-35 multirole fighter jet produced in the interests of the Defense Ministry of the Russian Federation have been completed. The certificate of the trials completion was signed in December 2017," the press office said. During the trials, the MiG specialists checked the fighter’s onboard radio-electronic equipment, the sight and navigation complex, the radar, engines and other aircraft systems. The work was carried out throughout 2017 with the assistance of test pilots of Russia’s Defense Ministry. 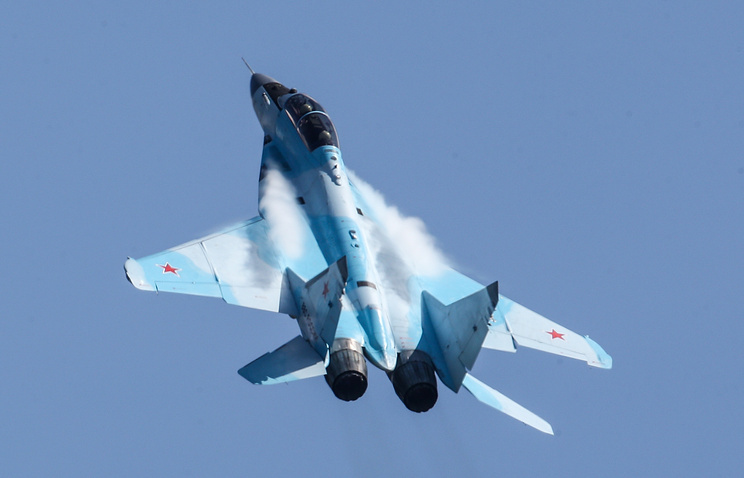 "By its combat potential, the scope and the efficiency of its missions and the price/quality ratio, the MiG-35 is today a perfect combat vehicle for operation in high intensity armed conflicts," MiG CEO Ilya Tarasenko was quoted by the corporation’s press office as saying. "The aircraft makes it possible to use the entire range of existing and up-and-coming Russian and foreign armament, including weapons designed for heavy fighter jets," Tarasenko added. Russia’s state armament program through 2020 stipulates the deliveries of MiG-35 fighter jets to Russia’s Aerospace Force. As President of the United Aircraft Corporation Yuri Slyusar said on the sidelines of the Russian investment forum on Thursday, a contract for the delivery of MiG-35 fighters to Russia’s Aerospace Force may be signed this year.